I posted a blog last week about how people need to stop freaking out and/or being surprised at my blood sugar numbers, I also shared an etiquette card for non-diabetics that I believe is valuable. When I posted the blog, I got several responses from self-proclaimed “meter peekers” saying that they worry over their spouses’ numbers and the evening I posted the blog, my husband asked, “Is that blog directed at me?” And it’s totally not! There are a few individuals that I personally feel are permitted meter peekers, in my life it’s just my husband. In our marriage Brad and I share everything, including the treatment of my diabetes. He knows how to check my blood sugar, how to do a pod change and how to treat a low. He also knows all my numbers. When I am unable to care for myself, he cares for me (for example extreme low blood sugar or under the effects of anesthesia). But he also doesn’t freak out. I remember a few months after my diagnosis, I tested my blood sugar at 52 and I said, “I’m 52, I need to eat.” Brad said, “Ok” and didn’t do anything else. As I was getting food, I wondered to myself, does he even care that I’m low? But as that fog cleared, it dawned on me: My husband was aware I was low however, he saw that I was handling myself just fine and didn’t need help. I believe strongly that our partners (as well as parents in the case of young children with type 1) should have the access to things like our numbers. They also are the most likely people to act appropriately whatever the number is. And that’s my point. Every person with diabetes is different and has a different relationship with their numbers, sometimes we need to digest them before sharing and other times we’d like to just test and carry on to avoid feeling like diabetes interrupts everything we do. Who are your permitted meter peekers and how do you handle peekers without permission? This entry was posted in Commentary, Type 1 Diabetes and tagged Conversation, Diabetes, Family, health, husband, K-Couple, Rachel, Type 1 Diabetes by Rachel. Bookmark the permalink. I hate when my parents ask what my number is. If it’s not within range they immediately get alarmed and start asking me why my blood sugar is high/low. It can be frustrating. In high school another girl in my circle of friends was diagnosed a month after I was. We had the same English class during the period that determined when you would eat lunch so we went to the same nurses office to test at the same time. I hardly ever had good control in high school and this other girl was in my opinion barely diabetic and almost always around 100. She would look at my meter and scoff at me. The nurse would also praise her and shake her head at me. 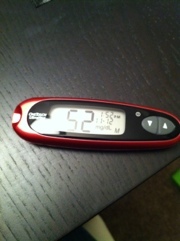 Not exactly good for a positive diabetes self image. That’s so uncaring! (of the nurse) and counter-productive.